20 assorted building pieces, plus dozens of accessories. Easy to assemble. Fold them flat, store them up again for the next game! This set continues the Cardboard Heroes tradition of great miniatures and accessories at a low price. 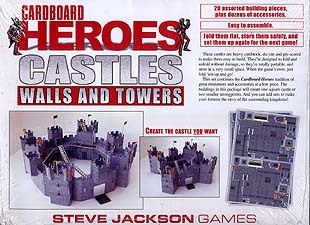 The buildings in this package will create one square castle or two smaller strong points. And you can add sets to make your fortress the envy of the surrounding kingdoms!